When NASA asked Boeing to predict what they believe would be the future of airplane design, they had one simple answer: electric. 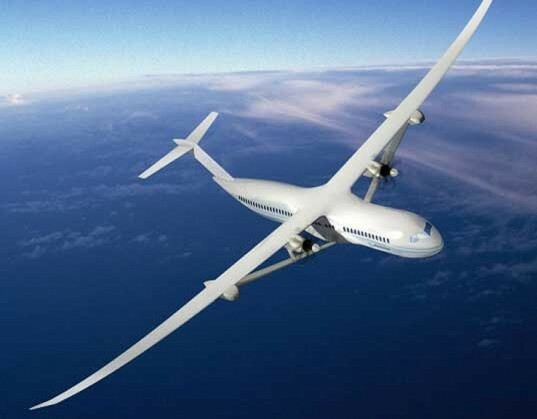 Called the Subsonic Ultra Green Aircraft Research (SUGAR) Volt flight, this commercial plane will combine electric power with traditional fuel, enabling low-emission flights across the globe. Coupled with a broader wing span, the SUGAR re-imagines the standard plane as a lightweight, energy-efficient model for future commercial flying. Similar to a hybrid automobile, the SUGAR would power up at the airport by plugging into an electrical source. Dual turbine engines would be placed under each wing and fired up with traditional fuel during times when greater power is needed, such as takeoff. During the flight, portions of the journey could be made emission-free by switching over to electricity to power the turbo-fans. All in all, the flights would reduce the amount of fuel burned during each run by a whopping 70 percent. Adding to its energy-efficiency, the SUGAR Volt’s wings would stretch to almost double the length of traditional planes today, allowing for greater lift and shorter take off and landing times. In order to accommodate existing airports, the long wings will fold when landed and enable the plane to taxi and park at the airport gate safely. Boeing hopes to have the SUGAR Volt in flight by 2030.